Butterweed, photographed at Loxahatchee National Wildlife Refuge, Boynton Beach, Palm Beach County, in March 2017. Depending on where it's growing, butterweed, Packera Glabellus, is either a curse or a delight. It's a curse to a farmer who finds it growing in his fields because of the toxins it contains that can kill livestock. The delight part is obvious — and surprising. In many areas, it is one of the first signs of spring, and a gorgeous one at that. Few flowers rival its boldly golden hues, at least to our eyes. It is a Florida native, found throughout most of the state but is considered rare in the southern end of the Peninsula. Its range extends through the southeastern United States to North Carolina, skipping Virginia and reappearing in Maryland, through the Midwest to South Dakota and south to Texas. It also grows in parts of Ontario but it is not native to the proviince. 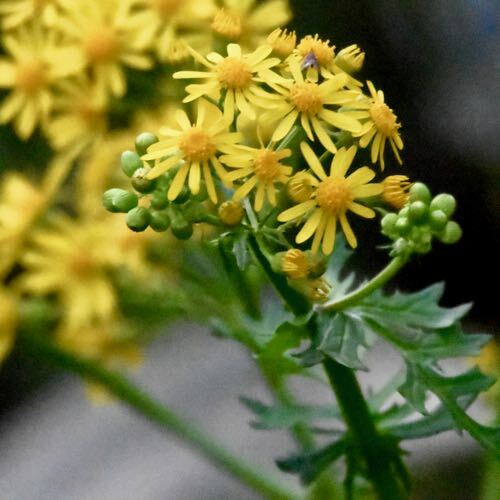 Ohio lists it as a prohibited noxious weed even though the state is part of butterweed's native range. Butterweed is an annual that emerges in late fall and early winter. At first, it's just a cluster of leaves, a basal rosette, just off the ground. In late winter, early spring, it sends up a hollow stalk that can hit three feet tall, atop which are the golden blossoms. In turn those flowers produce whispy seeds that get blown about by the wind to spread the next generation. In places, especially in spring, butterweed can be so numerous as to produce vast swaths of yellow-gold. Butterweed's early-in-the-season habits serves to its advantage in the struggle to survive. For one, the young plants emerge at a time when other plants are dormant and offer little competition for sunlight and nutrients. Also, bees coming out of winter dormancy have few options in their quest for nectar so they hit up butterweed more frequently than they might otherwise. It is a plant of wet and even swampy places. 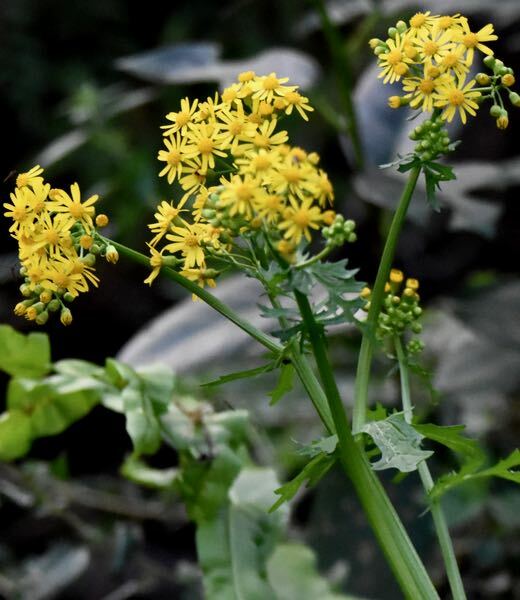 The leaves of butterweed are deeply lobed, green atop, reddish purple below, large at the base of the plant and becoming progressively smaller higher on the stalk. The stalk vaguely resembles a celery rib, the flowers daisies and the plant as a whole mustard greens, at least at a distance (the flowers are much different). The stalk tends to be weak and the plant can have a lean to it, as this one does. Butterweed is not a plant a farmer wants to see growing in his fields. The leaves contain poisons called jacobine and seneciphyline that are deadly to cattle, horses, goats — and humans. They cause liver damage, and if eaten in sufficient quantities, death within a day or two. Herbicides can be a problematic solution for obvious reasons. But in Louisiana, butterweed plays a vital and unlikely role in the life cycle of the Pelican State's signature food: the crawfish. According to Loyola Universtiy New Orleans, butterweed grows along rivers like the Atchafalaya, emerging and flowering before spring's waters swell their banks. When the waters come, the plants decay and become food for that tasty crustacean. Take away butterweed and you take away crawfish. Butterweed is a member of Asteracease, the sunflower family. Other common names include crossleaf groundsel. 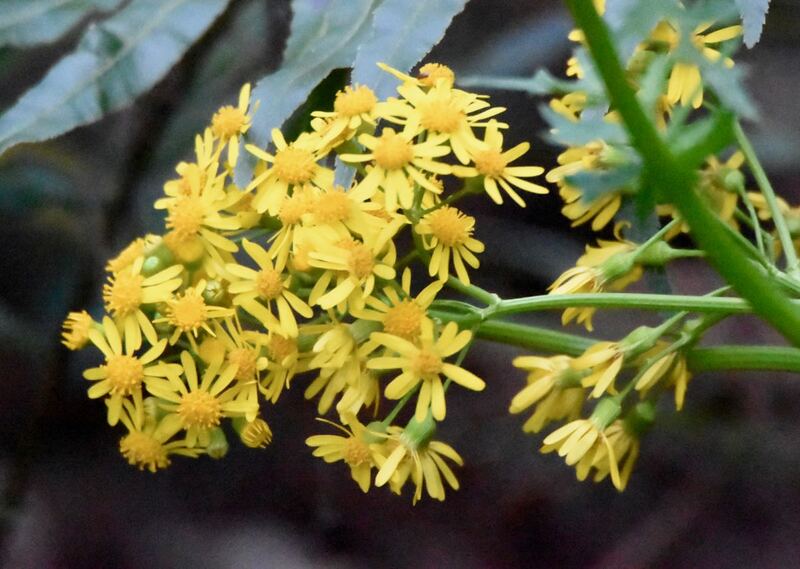 One taxonomic note: the plant's accepted scientific name used to be Senecio glabellus. We mention that because that's how it's listed in Cornell University's database of poisonous plants. All photographs are property of the publishers and may not be used without their express permission.